"This is a well-written and easy-to-read book, not only for pharmacy technicians already in practice seeking advancement, but also for pharmacy students who will begin intern positions." "This all around guide to effective counseling features useful tips and suggestions for improving patient care through effective communication, and questions for reflection at the end of each chapter." 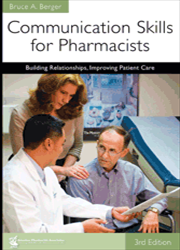 • 15 chapters from the previous edition cover key communication skills for pharmacists, such as listening and empathic responding, supportive communication, persuasive communication, assertiveness, and conflict management; provide help for patients in accepting the behavior changes needed to manage their illness; and explore ways to become culturally competent to provide quality care for all patients. • A new chapter tells how to communicate about sensitive topics that patients may find difficult to discuss because of embarrassment, cultural beliefs, or fear of social stigma. • Another new chapter describes the way limited literacy or limited health literacy can affect patient outcomes and how pharmacists can identify and help overcome such limitations in their patients. • The expanded chapter on managing change emphasizes the use of motivational interviewing. • Dozens of examples share good and bad pharmacist–patient and pharmacist–physician dialogues. • Guidelines tell how to contact a physician and then build rapport and discuss drug-related problems with him or her. • Questions for reflection appear at the end of each chapter.